The performance I will carry you over hard times continues the research into reduction that formed Falk Hübner’s PhD research, finished in november 2013. More specifically, Hard times continues the line of works such as Thespian Play and almost equal, works that take away external elements of musical profession (such as the instrument) and investigate the choreographic potential of musical movements, resulting in so-called “musical choreographies”. Two specific aspects are added or deepened in Hard times: first, the performance ventures further into the choreographic potential of musical movements, specifically movement in space, rather than standing more or less still on a specific spot. Second, the work extends this movement in space up to the radical point of total exhaustion. As the performer has to move very quickly from specific spots on stage to others, continuing for an extended period of time introduces a play between the possible and impossible. Concerning the creation process, Falk explores the idea of developing the work by presenting both process and progress in the form of lecture performances at conferences. The difference with the usual audience talks is that conference mostly present the possibility to discuss with an informed professional audience, resulting in different possibilities for reflection. In the first rehearsal phase Maarten and Falk started to collect various materials around the idea of miming the marimba and other percussion instruments. This resulted in a few studies on marimba, playing with the mime idea, including small interventions such as leaving out notes from the soundtrack. The final study was a choreography, in which Maarten changed between marimba, bass drum, congas and tam tam. This study was developed within a rehearsal time of about 30 minutes. Its main purpose was to have a first look at the opportunities of moving in space while changing instruments. As a first result of the process, the studies up to this point were presented by Falk and Maarten in the performance lecture Reduction as a means to enhance visual and choreographic potential in musical performance, at the 5th global conference of Inter-disciplinary.net, “Visual Aspects of Performance Practice”. As a result of the discussion and feedback from Prague, the framework and setting of the performance went into the next design phase, which focussed mainly on the idea of movement in space. Rather than having the musician stand more or less still on one spot, as previous works such as Thespian Play or almost equal / meistens gleich did, Hard times emphasizes much more the performer’s movement between different spots – and thus absent instruments – on stage. At the end of this research and experiments into movement in space developed the idea of the musician’s total exhaustion, due to the amount of movement that is necessary to reach the instruments at the right moment, to hit the “virtual percussion instruments” when the soundtrack would play the corresponding sound. In december 2014 Falk and Maarten shared this state of the process at a lecture performance at the conservatory of Utrecht, and discussed the findings to that date with the audience (music students, conservatory teachers and research colleagues from the Research Centre Performative Processes). A main outcome of this discussion was that it was very exciting and fascinating for the audience to see when Maarten does not reach the desired instrument. This brought in elements of play, and the intense experience of the performance concept as such: As long as Maarten performs the movements in perfect sync with the soundtrack, the audience can almost forget that he does not actually produce these sounds by himself. As soon as he does not “reach” the spot of the absent instrument in time, the concept or “rule set” of the performance itself becomes accentuated, which was received very positively by the audience, and worth looking into in the further process. Working further from this experience, the creation process went into its third phase, which is the phase the two collaborators are currently in. 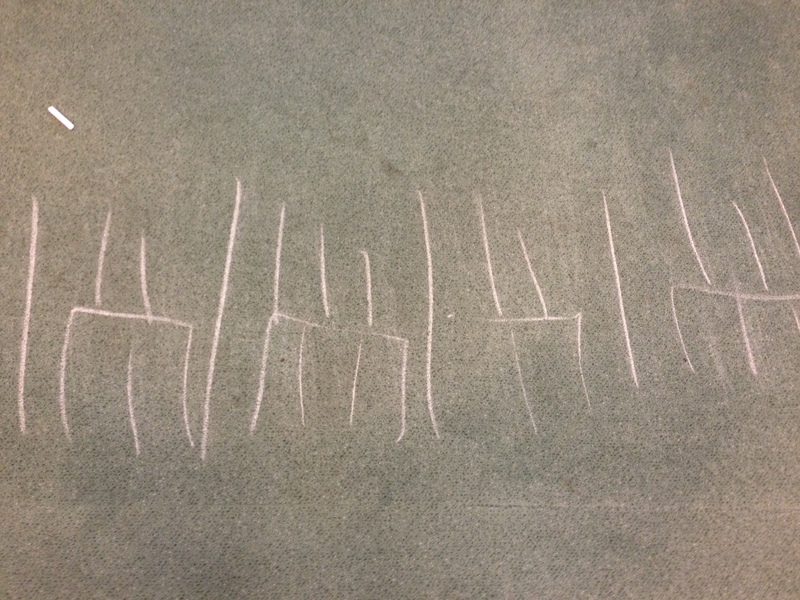 In the rehearsal session after the last lecture performance, several minor elements and ideas have been tried out, such as the visual and aural use of chalk. In the meantime, the setting and framework of the work has become clear, the main elements are collected. After the rehearsal several agreements have been made, such as the total collection of materials and the global structure of the performance. It is important to note that all previously composed music is possible to be included in the final work in one or another way, but its main purpose always has been to provide material that can be tried out in terms of the whole performative setting, such as music written for being a “test” for the musical choreography. The first video above is a good example for this, as this is not yet the “real” material for such a section, but it served the purpose that Falk can test the idea of movement in space.